“The washing machine,” she replied. Wow, can you imagine life without a washing machine? When I am 101-years-old, if I were to be asked the same question, my reply would be “capnography.” It is my hope that 60 days, 60 weeks, and 60 years from now all providers cannot imagine life without capnography. I once had an instructor who said “air goes in and out and blood goes around and around; any deviation of such is a bad thing”. Air goes into the lungs, oxygen diffuses across the alvelor-capilary membrane, gets picked up by a hemoglobin molecule in a red blood cell and is transported to the cells that need it. At the cellular level, the oxygen is used via the Krebs cycle to generate energy and a byproduct is carbon dioxide (CO2). The CO2 dissolves into the blood and is carried back to the lungs where it is eliminated during ventilation. Capnography is the monitoring of the concentration of CO2 at the end of expiration; hence the term “end tidal CO2”; the concentration of CO2 at the end of a normal tidal volume breath. Studies of patients in cardiac arrest have proven with 100 percent sensitivity and 100 percent specificity that waveform capnography detects correct placement of endotracheal tubes in victims of cardiac arrest. One-hundred percent sensitivity and specificity are very rare. use of pulse oximetry has historically been used as a measure for the monitoring of ventilation, however it is not the ideal tool. To interpret pulse oximetry values correctly, one must understand the oxyhemoglobin dissociation curve, which is a backwards “S” shaped curve which illustrates the relationship between arterial oxygen saturation (SpO2) and the amount of oxygen that is dissolved in the blood (partial pressure of oxygen, PaO2). There may be a significant delay between a change in alveolar oxygen tension and a change in the oximeter reading. It is possible for arterial oxygen to reach dangerous levels before the pulse oximeter alarm is activated. For example, a patient’s oxygen saturation can be in the range from 90 – 99 percent while the PaO2 drops from 100 mm Hg to about 60 mm Hg. Another limitation of pulse oximetry is that it is inaccurate in patients who need it the most. It is mandatory to have a good pulse waveform and the pulse oximeter fails to give accurate readings whenever the peripheral pulsations are poor, which can occur during shock states, motion artifact, and probe dislodgement. The use of continuous waveform capnography with supraglottic (extraglottic) airways has now been proven to be accurate and an effective means to monitor the airway patency and placement. In addition, the effectiveness of bag valve mask ventilation can be monitored by the use of capnography. Capnography allows you to observe mechanical ventilator compromise at time “zero” when the airway or ventilator status deteriorates instead of waiting a minute or two until the pulse oximeter reading drops and the patient is acutely hypoxic? If you observe an abnormal waveform, first check the patient’s physiological status and compare what the capnogram is revealing along with other physiologic parameters. This is the primary intervention, if no abnormalities with the exam such as an airway obstruction, the patient biting on the tube, or respiratory depression continue on to check the equipment. Check the sampling line system to rule out kinks, disconnections, or obstructions. In extreme cold environments consider freezing of the condensation in the sampling line as the cause of an obstruction. Check for endotracheal cuff leaks, hypopharyngeal placement of endotracheal tube, esophageal intubation, patient breathing over the ventilator. Especially in pediatric patients, dislodgement of the endotracheal tube can easily occur during transport. In conclusion, capnography is the gold standard for monitoring airway patency whether the patient has an artificial airway in place or is maintaining their own airway. Capnography provides real time, instantaneous, breath-to-breath information and allows for rapid detection of and response to airway compromise. 1. American Heart Association. Circulation. November 2, 2010, Volume 122, Issue 18 suppl 3 Part 8: Adult Advanced Cardiovascular Life Support: 2010 American Heart Association Guidelines for Cardiopulmonary Resuscitation and Emergency Cardiovascular Care. Part 9: Post–Cardiac Arrest Care. 2. American Heart Association. Circulation. November 2, 2010, Volume 122, Issue 18 suppl 3 Part 8: Adult Advanced Cardiovascular Life Support: 2010 American Heart Association Guidelines for Cardiopulmonary Resuscitation and Emergency Cardiovascular Care. Part 13: Pediatric Basic Life Support. 3. Kamat, V. (2002). Pulse oximetry. Indian Journal of Anesthesia. 46(4):261-268. 4. Wampler, D. (2011). Capnography as a clinical tool. The capnography waveform is a key vital sign when determining treatment for a patient in the field. EMS World. 40(8):37-43. 5. Minkler, MA, Krost, WA, Mistovicgh JJ, Limmer, DD. (2008). 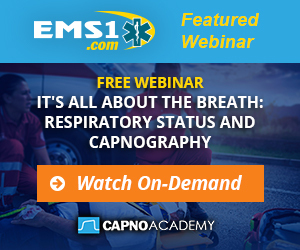 Beyond the basics: Capnography. EMS Magazine. 37:37-74-78. Susan Thibeault, MS, MBA, CRNA, APRN, EMT-P, CCRN, CFRN, CTRN, CCT-P, FP-C is a Certified Registered Nurse Anesthetist at YALE New Haven Hospital and the air and ground transport certification director for Allegro Reviews where she specializes in preparing transport professionals for success in their certification exams. Susan is a previous flight and ground transport nurse with both prehospital and interfacility transport experience. She is the editor of the 6th edition of the “Transport Professional Advanced Trauma Course (TPATC)” textbook published by the Air and Surface Transport Nurses Association (ASTNA) as well as a popular instructor. Most recently she has become an Educator in the Professional Affairs and Clinical Education (PACE) team for Medtronic (formerly Covidien) and enjoys being in the field with EMS providers teaching about the use of capnography. Susan is a popular speaker at critical care transport and medical conferences nationwide.